Started from GG version 8.1.2 speedhack work on Intel (x86) devices. And in emulators too. In video - BlueStacks - x86 emulator. You can subscribe to our new videos. 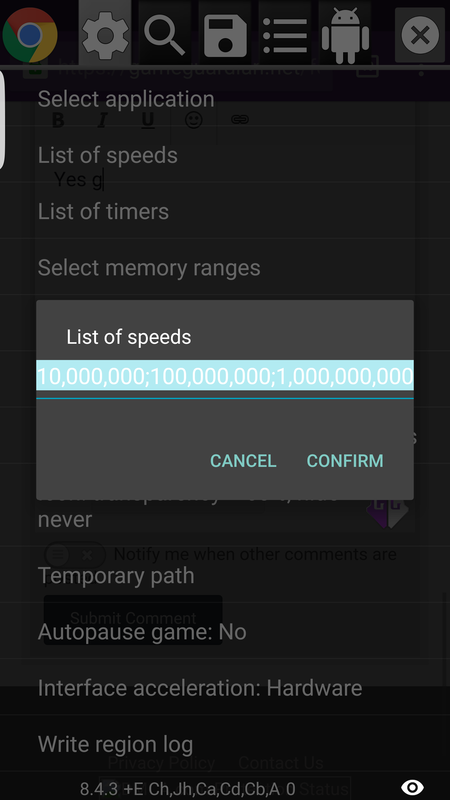 Hi Enyby, I see in some your videos in youtube that you used x0,4 as speed rate, I don't have this ratio in my GG, is there any way to customize the speed ratio preset? And this info written in help inside app. Read it. EDIT: Forgive me, I didnt see that there is a so long hide numbers if you scroll to right and left of the list. Hi Enyby, Am a great fan of your R&D Videos... I want to know how to manipulate game timer/s with Game Guardian to improve Game completion time, like in Events, Please do reply.. thanks in advance. I think It can not be doned. You can slow down game but it only slow down no any changes of total time in race. And/or is there a way to increase the Speed of the Car beyond the MAX/PRO levels with GG..
Can I use it in event but do not go to cheat board?